These were a marvelous improvement over the original boot design. They distribute the weight stress to two different areas. Without the calf loop all the pressure is focused around the instep which can be intense. Also the loops put a 2 degree bend in the knees for comfort. Calf Loops are removable. Bar diameter must not exceed 1-1/4" (3.2 cm). Use of an oversize bar that does not fit loosely to the bottom of the hook could cause hook failure. Caution: Hanging from a bar using Gravity Boots require you to be in good physical condition. If you are not young and athletic an iversion table is a better choice. If you have a back problem, an inversion table is a better choice. If you want your wife, mother etc. to be able to receive the benefits of inversion, an table is a better choice. If you are over weight, or somewhat over-the-hill an inversion table is a better choice. If you want to be able to relax during inversion an inversion table is a better choice. arches can be done easily. Keep in mind it may look easy in the photos but if you and those who are going to get the benefits of inversion are not in excellent physical condition and athletic you may want to choose an Inversion Table as the wiser and easier choice. If your ankles are extremely thin boots may not fit as well. 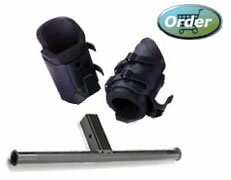 We do have Extra Large Cobra XL Gravity Boots for very broad ankles and calves. The diameter is 1" larger and the height of the shell 1-1/2" taller than the standard boots. The standard boots have at the largest setting approximately a 4 inch diameter and 12 1/2 inch circumference. This is an approximation only because there is flexability in the foam and boot shell. Extral Large are 1 inch larger in diameter & 1-1/2" taller than the standard boots. Please Note: The Teeter Chin-Up Bar has been dis-continued. 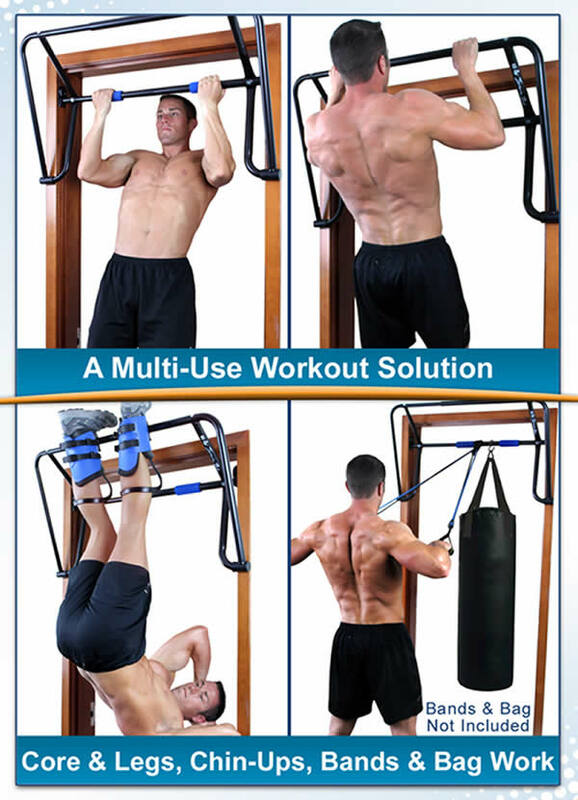 However, the EZ-Up Inversion Rack is actually a chin-up bar with the rack bolted to it. You can use it either way. 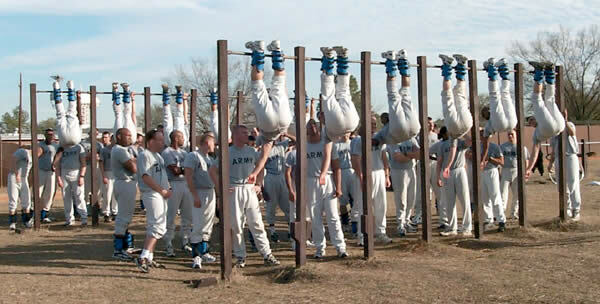 The chin-up bar alone or with the additional rack bolted on. The reason the EZ-Up Inversion Rack is a a better choice than the Inversion - Chin-Up Bar is because the Rack lifts you up and above the top of the door jam by about 5-6 inches. Giving you room to stretch and do exercises. welds). The rack is rated to a maximum of 250 lbs. • Adjustable for Doorways 28" - 36"
constructed to national building code standards. into and out of the inverted position. Places the user out and above the door frame for extra height and full range of movement. 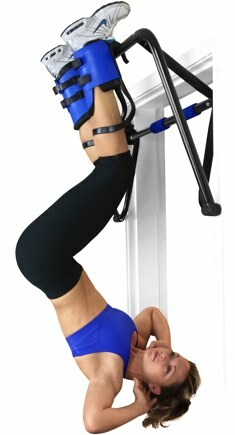 The user does not have to bend completely in half to mount and dismount the rack..
and help prevent calluses and slippery hands when performing chin-ups. all Hang Ups home-use products. itself is easy to put up & take down as desired. Using gravity boots on a bar takes a very athletic person in excellent condition and in good health. If this is not you and you still want the benefits of inversion without the extreme effort and stresses on the body required if you are to hang totally upside down, we recommend the Teeter Hang Ups Gravity Traction Inversion Table EP-950. With this equipment you can gradually ease into inversion and choose your angle of incline, including total inversion. With the table EVERYONE can achieve the benefits of inversion without the athletic effort necessary with the boots and rack. One of the great values of the Teeter inversion tables is that they can be modified to be use with gravity boots. The F5000, F6000, F7000 F8000 and EP-550 Inversion Tables can be modified with the Adapter Kit. The EP-950 can be modified with the Special Adapter Kit. 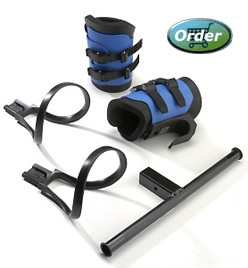 The Adapter Kit includes Gravity Boots and a CV Bar (conversion bar) to convert the standard ankle clamp assembly for use with the Gravity Boots - See how it assembles. The Boots wrap around the ankles and provide them with extra support and comfort. 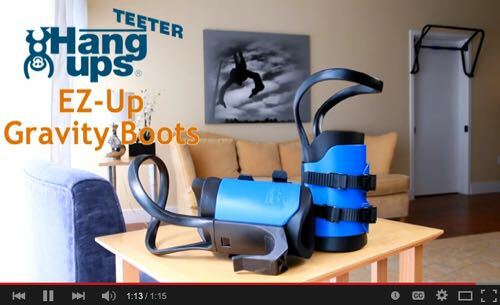 Teeter Gravity Boots have a larger surface area than the standard instep lock on the inversion table and generally will provide greated comfort at the more extreme angles. If your ankles are extremely thin, gravity boots usually will not be comfortable. With the Gravity Boots you can invert on any bar that meets the security requirements. 300 lb weight limit on Teeter inversion tables. 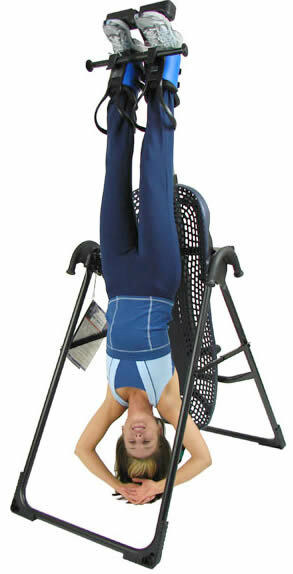 Most people do not need gravity boots to get the full use of their inversion table. 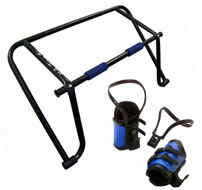 Do not use Teeter Gravity Boots with the EZ-Up Inversion Rack or Inversion - Chin-Up Bar if you are 250 lbs (113.6 kg). Structural failure could result. An inversion table is a much better choice. The EZ-UpTM Inversion System offers a full body stretch and is a great tool for inverted exercises like crunches, sit-ups and squats. In fact, full range inverted sit-ups are ten times tougher than horizontal sit-ups. With minimal load on the back. You can also work the biceps, triceps and other muscles by grabbing hold of the bottom of the rack and pulling with your arms as you do up side down squats. 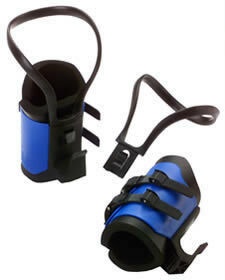 Using gravity boots takes a very athletic person in excellent condition and in good health. If this is not you and you still want the benefits of inversion without the extreme effort and stresses on the body required if you are to hang totally upside down, we recommend the Teeter Hang Ups Gravity Traction Inversion Table EP-950, or the Power II Inversion Table, or the. With this equipment you can gradually ease into inversion and choose your angle of incline, including total inversion. With the table EVERYONE can achieve the benefits of inversion without the athletic effort necessary with the boots & rack.